The City of Sebastopol has proclamated September 18, 2016 as “Bloomin' Backyards Educational Garden Tour & Market Day” in Sebastopol. On August 2, 2016, Mimi Enright, Program Manager for the UC Master Gardener Program of Sonoma County, and Ellen Zaslansky, an MG volunteer, were pleased to receive the proclamation from City of Sebastopol. 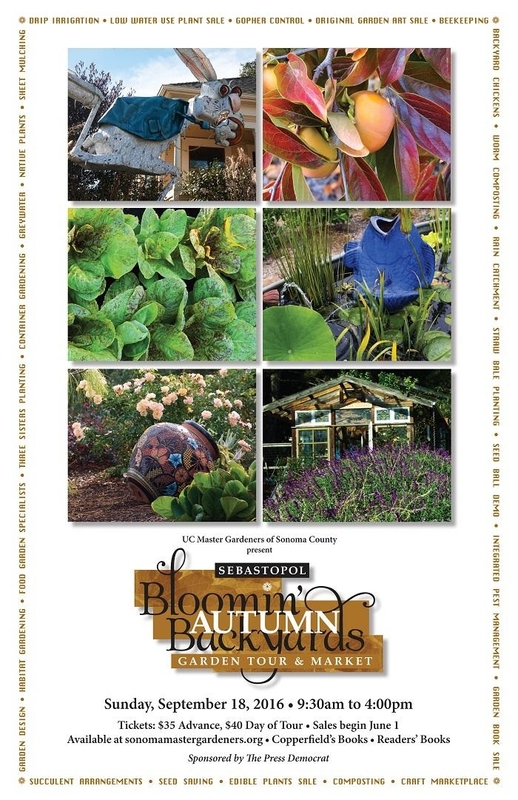 The biennial “Bloomin' Back Yards” educational garden tour is returning to Sebastopol on September 18th and offers a tour five private gardens in the Sebastopol/West County area along with a plant, crafts, art & book sale. The public will find expert advice and demonstrations on growing low-water use plants & vegetables, lawn replacement, drip-irrigation, gopher control, compost, soil improvement, beneficial insects and bees, and much, much more! Learn more and get tickets now.